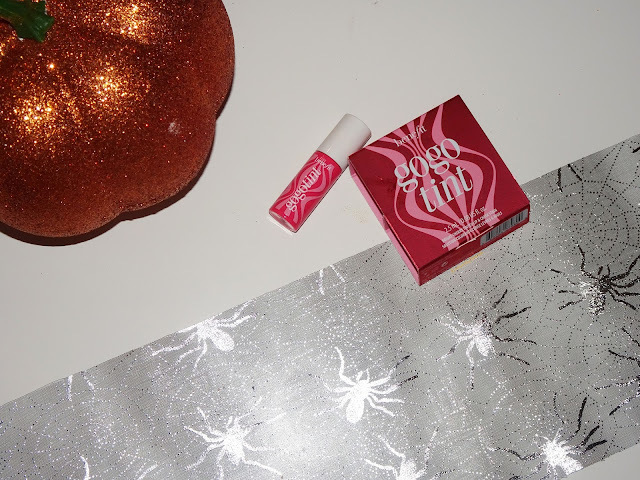 I have never been a person who gravitated to lip tints, or stains, I mean I have tried some in the past and have really enjoyed then in certain situations. I have never been one to want the Benefit tints, however when I got one in a Birchbox recently I new I was excited to try it out and share my thoughts on something I wouldn't normally buy. I got the shade GoGo tint and I was glad I did as it looked so pretty and I was very excited to give it a go. 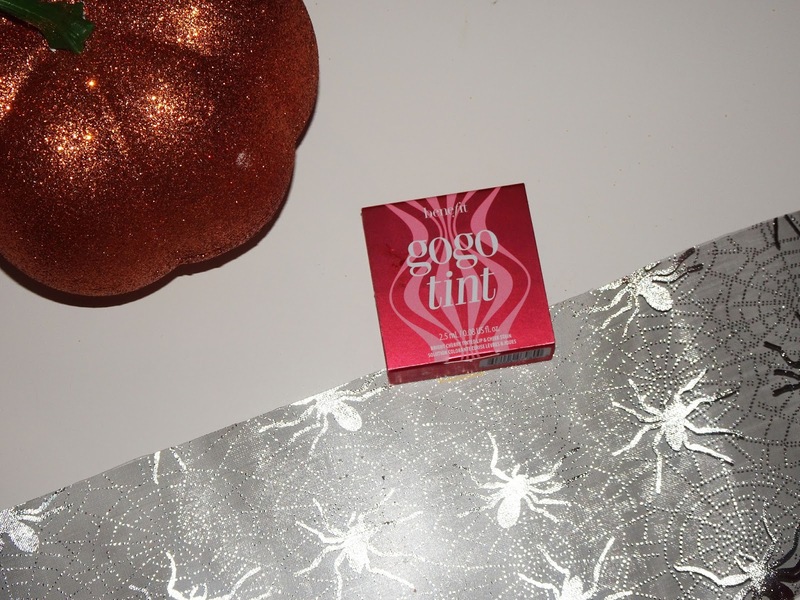 The GoGo tint I have is a mini version, however, it is in the same packaging that the full size comes in, so I think that is really nice as it will be used in the same way. The bottle is a small 2.5ml one but it has lots of product in and will last a really good length of time to really test this out and see if you want to purchase the full size. The product has a nice white cap which screws on and has a little lip gloss style brush inside. The brush makes this so easy to apply and I like the size of the wand in comparison to my lip shape. The main container of the product is a beautiful bright pink bottle with pale pink detailing and white text which looking fun and interesting without being over the top. If I am honest, it reminds me of a stick of rock, but I cannot say for sure why. The product feels quite a thin consistency but has really good pigmentation and stains the lips really well. The colour is quite runny and so it is super easy to apply to the lips and let it sink in for a few minutes, to stain and dry on the lips. I like the way this makes the lips look a beautiful just bitten pink shade which is so lovely for a day to day look, or can be used as a feature lip if you want to go out. This product can also be used on the cheeks as a cheek stain, this for me is not something I want to use regularly as I just don't reach for any kind of cream or liquid blush. 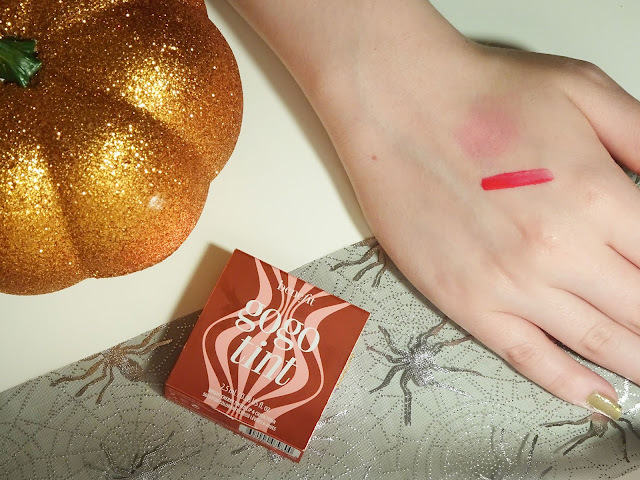 I did a mini swatch next to the opaque one above that shows this blended and it does make a nice cheek colour, I just find you have to work quickly with it and try not to let any of it dry before blending it or it can look patchy. For me, I just think this is better kept for lips for what I like. Overall I have been quite enjoying using this product, especially to say it is a type of product I wouldn't normally reach for. The product has a comfortable consistency and lasts really well on the lips and I think as a quick fuss free colour it is really nice. I find I don't reach for this a lot, but I have been enjoying it when I do reach for it and I think it is one that will have a good place in my make up collection, while not being over used. At £25.50 for 10ml, on Boots here, I think it is a decent product, but for something that I wouldn't choose to use anyway it is a little expensive in my opinion for my make up taste. I do think this is a lovely product, and if I could try more of these in the size I have here I probably would give them a go, however I don't think I would spend the money on a full size one as I just don't think they are a product I ever reach for enough, I prefer my matte liquid lip colours. Let me know if you love lip and cheek stains, or what your favourite lip colour is in the comments!